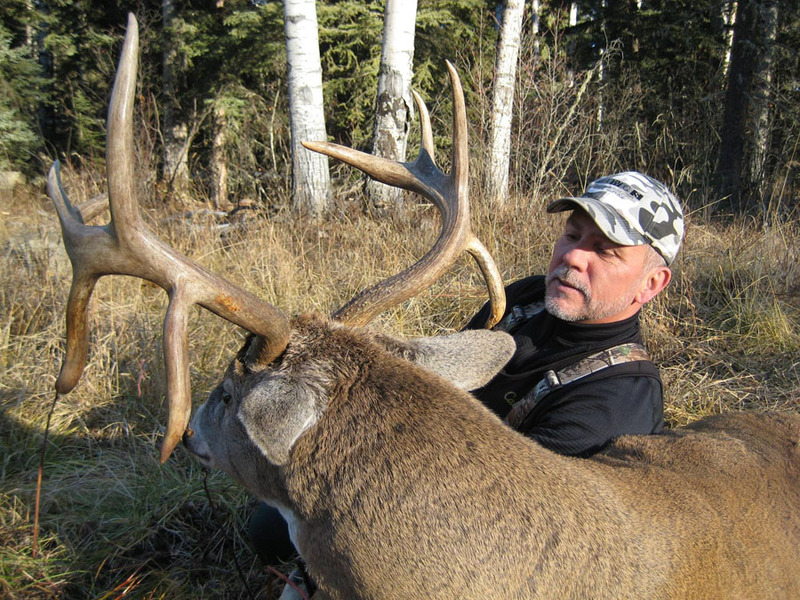 Alberta has some of the biggest, heavy, dark antlered deer in the world. Our area is 85% forest land (public land) and 15 % farm land (private land). There are over 1 million acres of land in our wildlife management unit, yes that’s right over a million!! This means lots of territory for your guide and outfitter to cover and also lots of habitat for your dream whitetail! This is a stand hunt, no driving around, and no pushing bush! Expect to hunt approximately 8 hours per day. While you are waiting for your trophy, your guide and other guides as well as your outfitter are out scouting and keeping up with deer and deer sign. You will be hunting in the fringe area or deep woods along travel corridors between bedding and feeding areas. Set ups will be in a tripod, ground blind, or tower blind which gives us the ability to move hunters “if needed”. Hunt locations are selected using a variety of methods including, aerial photos, ground work, trail cams and historical knowledge of our area. We carefully scout the hunting area all season in order to ensure that our hunters are placed in the areas we’ve seen the best whitetail bucks. I am a “hands on” outfitter with 19 years experience guiding and outfitting. I grew up shed hunting and spring scouting and developed a passion for chasing the elusive whitetail. While I attend to your hunt, I will also have experienced and longstanding guides with you every step of the way. There is no baiting of deer allowed in Alberta. You will not find fences, food plots or genetically bred whitetails hunting here! This is a 100% fair chase hunt in the whitetail’s natural habitat. You will be staying in our Full Amenity Lodge, including hot and cold running water, flush toilets, 3 bathrooms for hunter use, Satellite TV, WiFi, Home cooked meals, a fridge designated for hunter use only, and many other touches of home. We are also able to accommodate couples, with a separate private room and full bathroom.